In 1968, Lena purchased a home in Erickson from her daughter and son-in-law Helen and Henry Oshust where she resided until her passing on October 17, 1980. John and Lena's three surviving children are: Victor, Ludwig and Helen. Victor, a Forest Technician at Edmonton, Alberta. Ludwig Gerald "Jerry", an Auto Mechanic at Sooke, B.C. John and Lena had three grandchildren, Judy, Donna and Bonnie and five great-grandchildren Raylene, Daniel, Matthew Paul and Jody Dawn from their sons' marriages. Helen, attended school at Onanole, Ethelbert and Dauphin Collegiate, completing a Commercial Course in 1953. While in Winnipeg she was employed by the Department of Education and the Federal Forestry Department. In February 1957, she came to Clear Lake where she was a Secretary to the Park Superintendent, W.B. Mitchell. Helen and a friend Helen Erlendson attended a dance at Erickson where Helen met her future husband Henry Oshust. (refer to Oshust, Henry and Helen). Wasyl Kopeechuk and Pearl Kereluik were married in the Ukraine, in 1900. Wasyl immigrated to Canada in 1902, landing at Halifax where he worked for a year. He earned enough money to bring his wife, Pearl, and little daughter, Nellie, born 1901, and Pearl's brother, Joe Kereluik, to Canada. Wasyl continued working in the mine and Pearl kept boarders so the family could move on. After another year at Halifax, they moved to the Mountain Road district where their relatives, the "Todoruks", had already settled. Wasyl and Pearl received their homestead S.W. 10-18- 17W in the Scandinavia area. Pearl's brother, Joe Kereluik, applied for homestead April 26, 1909, on N.W. 1O-18-17W. The first summer a log home was built. Pearl plastered the cracks with mud. They started clearing the timber and breaking the land. A small lean-to was built onto the house to shelter a cow and heifer for the first winter. The family was increasing so Wasyl built a larger home. In 1928, he purchased N.E. 4-18-17W. In 1945, after their son Jack purchased the farm, Wasyl and Pearl retired to Erickson. Wasyl passed away in 1953 at 76 years. Pearl lived alone until her health failed, at which time she lived with members of her family. She passed away in April, 1978, at 96 years. The family were active members of the St. Mary's Catholic Church, Kerr's Lake. children, Larry, Adalia and Elaine. Leo - deceased 1965. Mike - deceased. Lawrence - married Judy Kingdon of Erickson. They are residing in Calgary. Donald - is employed and living in Brandon. Annie, born April 30, 1905. She attended Norland School and later worked in Doners' home at Erickson. Annie married John Boyko. (refer to Boyko, John and Annie). Mary, born November 17, 1907. She attended Norland School and later worked for Ted Lee's for a number of years, also at Souris, until she married Mark Soltys. (refer to Soltys, Mark and Mary). Christine, born April 6, 1910. She attended Norland School. 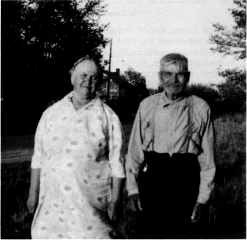 Christine worked at several farm homes - Harry Tillers', Fred Wettelands', Ole Lees', Theadore Lees', and Arvid Ullbergs'. She worked at Dr. Bowman's home in Clanwilliam for ten years. Christine moved to Toronto where she married William Inrig in 1936. They had an adopted daughter, Pearl. Christine later married Charles Podlesak on October 28, 1967 in Toronto. In 1974 they purchased a retirement home in Erickson.